Hornets - Gentle Giants! Printlayout = 535 Pixel! Bad press - what is true? 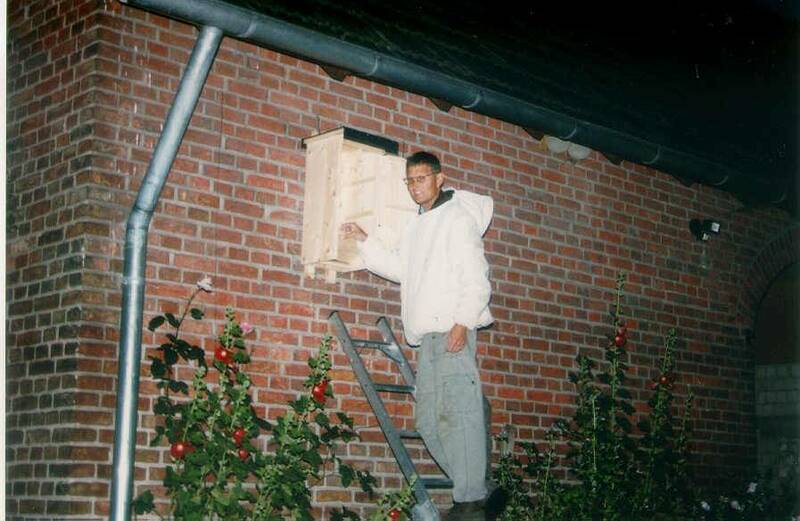 July, 22d - a bird nesting box is now too small for the hornetnest (that consist of 4 combs with about 180 workers). Workers start to fly out for searching a new place for the nest. July, 26th - beginning of the building of a new nest in a new place. This process is called relocation. 1) Rearing of males starts earlier than queens, usually by the end of July or the first week of August. 2) The demise of the old queen already begins with the eclosion of the first gynes in mid-September. 3) Mating flights take place on sunny days from mid-September to the end of October. The young gynes seek hibernation quarters immediately after mating. 4) Depending on the climatic conditions during the autumn this event may take place several weeks earlier, e.g. in northern Germany. 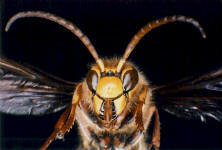 The majority of people consider hornets highly dangerous and their presence often causes fear and panic. This arises due to exaggerated stories of hornets attacks and the effect of their stings. "Seven hornet-stings kill a horse, three an adult and two a child". Such neighbourhood myths, held for generations, have led to the hornet becoming quite rare in many area of Germany, due to merciless human pursuit. 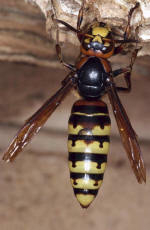 Indeed in many regions of Central Europe, the hornet is threatened with extinction! The largest European wasp; the female measures 25 to 35 mm long, males and workers are smaller. In males, the antennae have 13 segments, while females have 12. The male abdomen is composed of 7 visible segments, while that of the female has 6; females are equipped with an ovipositor. 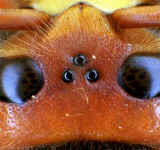 Eyes are deeply indented, shaped like a C. Wings are reddish-orange, the petiolated abdomen is orange striped with brown. Hornets belong to the order or group Hymenoptera. They are closely related to ants and bees, which are also in the same order. Hymenoptera means joined wings or married wings; Hymen = god of marriage, ptera = wings. The hind wings join to the fore wings with a row of tiny hooks (called hamuli). That outside of the nest area. In the presence of a hornet, four things should be avoided: rapid movements, blocking the flight path, vibrating or breathing on the nests. With care and calm it is quite possible to study the intimate life of hornets without being stung. Outside of the nest area hornets never attack groundlessly. Few people realise that hornets are amazingly peaceful animals, even shier than honey bees, which prefer to evade conflict. Scientifically it has been shown that stings of hornets are not more dangerous than bees and wasps. It is their considerable size (queen to 35mm) and loud flight noises that induce unnecessary fears. Those striking out in fear are those that may be stung. For most people a hornet sting represents no special danger. 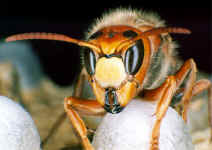 Hornet poison is not more toxic than bee or wasp poison! Unlike bees, the poison of wasps and hornets is not intended for use against vertebrates (like us) alone. Bees are nectar collecting animals, but wasps and hornets are hunters of insect prey. With several kilograms of honey in an average bees nest, the primary role of the bee sting is to defend the colony against sweet-toothed attackers, ranging from the mouse through badgers to brown bears and humans. Wasps have substantially fewer such natural enemies. This explains the autotomous sting of the honey bee, a bee will lose its sting and its life stinging a vertebrate. What it gains is the injection of additional poison from the poison gland which continues to pump on its release. Wasps and hornets use their sting to kill troublesome insect prey. They cannot afford to be wasteful, as they need to be able to sting repeatedly, injecting just about 0.16 - 0,19 mg poison (oven-dry mass). We, hence, have more to fear in the sting of the bee than the hornet! Sting advice: cooling the area is soothing, as for bee stings. In exceptional cases hornet stings, like other insect stings, can induce an allergic reaction, arising from an overactive immune system. These reactions begin with considerable swelling and redness in the affected area. In the case of a reaction you should see a doctor to be on the safe side. The hornet lives throughout most of Europe, but is never found north of the 63rd parallel. It is also found in Asia, the United States and Canada. Meanwhile also in Guatemala. Technically, this wasp is the only hornet in North America, but it did not originate here; it was introduced from Europe. The European hornet was first reported in North America about 1840 in New York state. Since then, it has spread to most of the eastern United States, reaching as far west as Louisiana and the Dakotas. Nowadays it is found in the northeastern quarter of the United States; ranging from Canada, Ontario, North Carolina, Tennessee and south through the eastern and central US, with scattered sightings extending west of the Mississippi River. 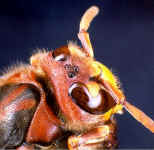 The European hornet "Vespa crabro" is the largest vespine in North America. It is the only vespine in the new world that is brown with yellow markings.The vertex of the Vespa crabro is much larger than wasps of the genera Vespula and Dolichovespula. Even though Vespa crabro is rarer than the various species of Vespula and Dolichovespula, it is not in danger of extinction in the USA. It seems to be doing well in its range there. Generally, it is considered to be a forest species in the USA. This means that it is rare to find a Vespa crabro colony near human habitats (unless it is out in the country). So, human contact with colonies of this particular species is uncommon in the USA. Though it does happen on occasion. However, few reactions to stings have been reported there. USA: Giant Hornet, European Hornet. Vespa crabro is there also commonly called the "Brown Hornet", and is sometimes mistakenly referred to as the "Japanese Hornet". This is the largest and, technically, the only true hornet found in the United States. It is not the same wasp as the "Bald-Faced-Hornet" (short introduction will follow later) or the "Yellow Hornet". The arrival of warm May days marks the emergence of the new queens, born and mated the previous autumn. They survive the harsh winter in rotten wood or the soil, their metabolism slowed down to a minimum. They also produce Glycerol, which acts as an antifreeze! After emerging their first task is to undertake investigation flights to find a suitable nesting-place and food in the form of tree sap and insects. Since natural tree cavities are becoming rare, they often use human habitation such as old sheds, behind the wood boarding of terraces and balconies, loft spaces and alike. When the queen has decided on a nesting-place, she first makes a small pedicel (stalk) from which the nest will be suspended. The first cell are built outwardly from it and are soon all occupied with eggs. After five to eight days small larva (quantity 1-2mm) develop, which during the coming twelve to fourteen days pass through five larval stages. They are held in by a sticky secretion initially and later by their sheer bulk pushing against the cells. 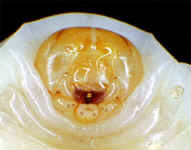 When fully grown the larva produce a fine silk thread, from a special gland, to cover the cell. So protected, the hornet pupae metamorphose during the coming thirteen to fifteen days. The young hornet then bites its way out of the cell. The newly eclosed worker will then rest, in an apparently idle fashion, in the cell from which it has emerged. However, even this seems to perform an important function by warming surrounding larvae, aiding there development. In this way, workers of Vespa crabro vexator are capable of increasing the temperature of surrounding cells from 21° C to 31° C in 6 minutes. Building material, contrary to other "general forage loads" such as water, carbohydrate-rich juices, and proteins in the form of insect prey, is not shared with other female workers in the nest. The foragers continue to process it and then add the building material to the nest structure themselves. A freshly emerged female worker (who does not go on foraging trips yet) can not, therefore, do construction work at the nest for this period. Workers will stay in the nest for two to three days before taking their first flight. Around this time a paper sleeve is started, which will eventually cover and protect the cells. Each worker cell can be reused up to four times. 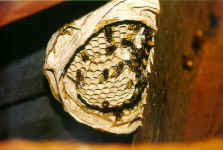 After five to ten female workers have emerged, the queen starts to fly from the nest less and less, with the workers taking over the role of foraging. Workers are noticeably smaller (18-25mm) than the queen (35mm), and only live for three to four weeks. Eventually the queen becomes nest bound and will never leave the nest again. With queen safely hidden in the nest, the most dangerous time for the colony has now passed. 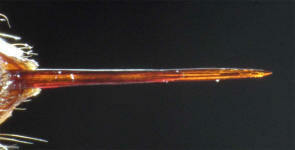 The queen now focuses solely on reproduction, the function she will perform until her demise at the end of the season. Hornet-queen with workers (her daughters), busy feeding and maintaining the starting cells (the queen is the larger wasp in the centre) If you think these are large: In parts of Asia and Japan Vespa mandariania, occurs, a close relatives of our hornet which is twice the size! More workers must be raised to allow the colony to grow. They work tirelessly collecting food, building materials and water. Hornets continue to forage, even at night during humid, windless weather! Hornets are attracted to bright lights like moths causing them to become disorientated. As a result, they often crash against window panes sometimes scaring the people inside. By turning out the light the however they are able to rapidly reorientate and will move on. Hornets are capable of flying with light intensity of 0,01 Lux, at which the human eye is completely useless. On warm summer days, the workers moisten the surface of the cells with water and so lower the temperature through evaporative cooling. After completing the first comb a new pedicel is built to allow construction of a new tier. Construction occurs basically downwards from the first comb, with additional lateral expansion of each comb and the paper. 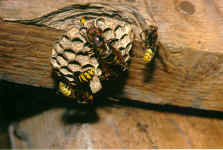 Hornets and other social wasps use paper (wood pulp) to construct their nests. In other words: they use rotten wood as the main building material for the nest. They scrape it from worn and weathered wooden fences, buildings, telephone poles, and other sources. They mix this with saliva and chew it up into a ball with their mandibles (mouth parts). This makes the wood fiber extremely soft and moist. 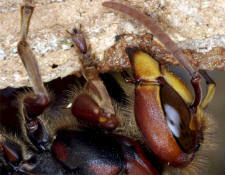 After a period of chewing, the hornet adds the paste to the nest structure and spreads it out with her mandibles and legs. After it thoroughly dries; a type of tough, durable paper is formed. The stripy pattern produced on the comb is characteristic of the hornet, each different coloured stripe representing the pulp from a different tree. If sufficient material is collected to the nest one flies and one further-builds at cells or nest covering; the saliva of the animals serves thereby as adhesive. This soft mass dries very fast to a paper-like layer. 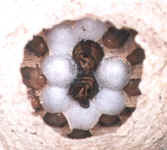 The strongly structured nest - covering with its fine grain and the numerous shell-like formed out air bags - reminds of veneer wood from different wood. The cells of the hornets are a true miracle of nature, whose building method has been passed genetically from generation to generation for millions of years. Large nests of hornets capture thousands of insects each day! The hornet is essentially a predator of a wide variety of insects. Hornets dismember captured insects with their powerful mandibles removing head, legs, wings and abdomen. Only the thorax, with the proteinaceous flight musculature, is transported as little meatballs to the nest and fed to the larvae. Larvae are nourished by the adults with this mixture of captured insects, paralyzed and masticated, which they regurgitate. If larvae are hungry, they are able to make a noise, listen here. During periods of bad weather, the larvae can feed the workers with a sugary solution. The larvae form a living food-store, which can help balance out the ebb and flow of supply to the colony (like honey in bees). Such food exchange between individuals is termed "trophallaxis". The queen needs more protein than the workers to develop her ovaries to producing eggs. The highly active workers need mainly only carbohydrates. 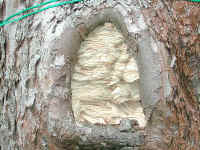 This they obtain these sugary liquids from damaged trees which seep sap, particularly oaks and ashes. In addition they eat the juice of ripe fruits: sap, juices of ripe fruits: apples, pears, plums and nectar. 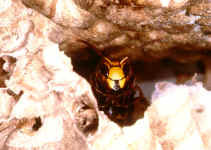 Hornets forage up to 1500 m from their nest. Hornet feeding on fruit, the three simple eyes "Ocelli", arranged in a triangle can be seen clearly. 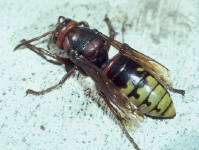 Two subspecies of hornet occur in Germany. The hornet shown in the photo, which carries a red "V" on the thorax, is Vespa crabro germana which is found in the west and south. Unlike wasps, hornets don't plague picnic areas in the summer in search of food. There is thus no danger of being stung in the throat by a hornet! In the absence of natural nest-cavities, hornet-queens sometimes settle in the spring in bird nest-boxes, although these rarely offer enough space for a mature hornet colony. By the early summer, with 25 to 30 workers and three to four combs such boxes are full. Thus the only possibility is to build outside the box or look elsewhere. In the latter case, workers fly out to search for suitable sites in the neighbouring area. 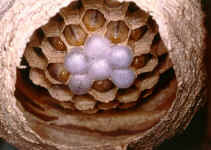 If successful, some female workers fly with the queen to a new, larger cavity where a new secondary nest is established. This process is called "relocation". Workers fly between the new and the old nest tending for both. The brood in the old nest are raised to adulthood while the construction of the new nest is underway. 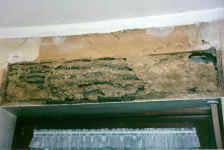 Eventually all the hornets move to the new secondary nest and the old nest becomes disused. How exactly the hornets are able to direct each other to the new nest site remains a mystery, although chemical signals are probably used. In the time between mid August and mid September, the hornet colony achieves its developmental peak, amounting to 400 - 700 animals and a 60 cm high nest. The queen now lays eggs, which become males (also called drones, quantity 21-28mm) and young queens. The appearance of the first sexuals (queens and males) indicates the decline of the colony. The workers gradually neglect the old queen and she eventually leaves the nest and, exhausted from oviposition, dies. The workers are now busy feeding the sexuals with protein and carbohydrates. This provides the young queens with the necessary reserves for the long hibernation phase. The sexuals do not take part in the work, just sit on the comb and feed. At this stage unemerged larvae have no chance to develop and lose weight eventually falling from their cells. On beautiful autumn days, the sexuals swarm out to mate. They collect by trees or close to the nest. After mating, males die quickly. The inseminated young queens now hunt for a suitable hibernation place. With a short life span, the last female workers die at the beginning of November and with them the last activity in the nest. Old nests are never resettled the following year. Many young hornet-queens do not make it through the winter falling victim to fungal attack or predation by insectivores. Hornets are worthy of protection! A large hornet colony captures several kilos of mostly annoying or even harmful insects through the season! If one considers the low mass of hornets prey, such as flies, spiders and wasps, it is clear that this amounts to a tremendous numbers of insects. 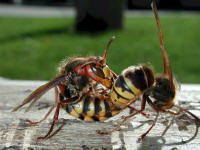 Hornets catch only living animals of prey, under no circumstances do they forage for carrion. At night hornets catch many nocturnal insects, of which bats are the only other predator. Hornets are the top predators of the insect world comparable with the birds of prey in the bird world. They are the eagles of the insects. Gardeners should be glad to have a hornet nest nearby! The main food of the hornets is approximately 90% flies, and only occasionally bees. Bee scientists state that the effect of hornets on bee hives is negligible. The daily catch from the beginning of June approx. is about 10-15 bees per worker, because only some hornets go to hunt bees. At this time a fully developed bee colony faces this predation with approx. 50,000 animals. If one considers the high laying rate of a queen bee, the number of bees emerging are in the region of 1,500-3,000 per day. Hence, the loss of bees is really relatively small (< 1%) for a healthy hive and no real threat. In addition, the bees killed at this time are not those which will go on to form the overwintering stock. Indeed, loss through weather and other causes (for example pesticide, herbicides, Varroa mite, traffic) are likely to have much more effect. a bee colony likes our hornet-box very much! Please put it to the test! Allow hornets to live near your hives. 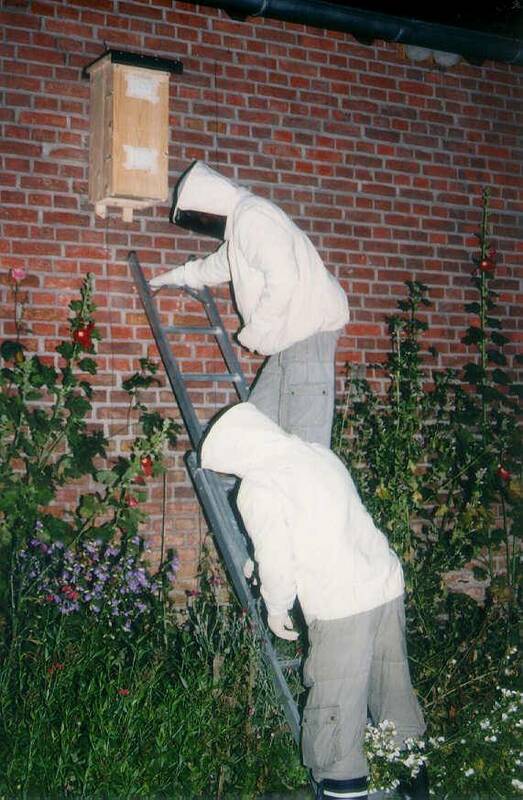 Some beekeepers even encourage hornets and erect a box near their hives because, as night-active hunters, hornets reduce infestation of the more damaging wax moth! Additionally, hornets hold a type of peace near their nest, they dont seem to hunt in the immediate vicinity. A nest provides fascinating observation possibilities of these beautiful black-yellow creatures rewarding you for the decision to set up a hornet box! Click here for a building guidance. At this size the nest contains approximately 150 animals. Check out the opening underneath the nest. This is called a "trash hole" because the hornets dump their trash out of this hole and falls on the ground below the nest. In order to ensure the survival of hornets, it is urgently necessary to maintain all natural nest cavities and, in addition, create artificial ones. The readiness of people to tolerate these beautiful animals in their neighbourhood must improve. In addition, the media should aim to remove their bad name and eliminate false conceptions. 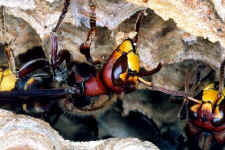 Hornets are protected animals in Germany: The native hornet (Vespa crabro) is included because of their acute stock endangerment among protected species. The law was introduced on 01.01.1987 as part of the protection of species law. It is illegal to kill them or their nests! In extreme circumstances nests can be removed by the fire-brigade or a specialist company. However, the removal of a nest present in a critical place may not take place without the permission of the landscape authority! Note: After federal nature protection law in Germany (BNatSchG) § 20f are punished irregularities against these regulations with deliberate or negligent offences in accordance with § 30 exp. 3 with up to 50.000 EURO penalty! The work of many years of hornet protection bears fruits: in almost all cases populations have responded positively to care. Hornet nests can be relocated but it is quite tricky. The way I do it is to collect all the workers from the nest first with a net and transfer these to a jar made with a 'lobster pot' one way top. For hornets and Dolichovespula wasps I use a net as there are up to about 300 individuals in a nest which is ok. You can net up to about 50 at a time and feed these into a pot. Normally though there are much fewer workers as nests are best relocated early in the season with only a few workers present. For Vespula nests a modified 12V vacuum cleaner can be used which has a pot before the fan, like a pooter. Then one can move the nest itself with the queen inside by carefully cutting its attachments and placing it in a box. I then put both the workers and the nest on ice for the journey. This stops the workers from flying around in the pots which usually kills them. At the new site the nest is suspeded on several length of flexible metal wire (they cannot chew through this) in a large bird box. The chilled workers are then readded with some honey to aid recovery and the nest box closed. As they come around they feed of the honey and will reorientate to their new site. If you do not chill them they often just fly straight out of the box and will never be seen again! One point of caution is not to chill the hornets too much as this will also kill them. Takes a little practice unfortunately! This technique I have also applied for Vespula and Dolichovespula nests. Dolichovespula are by far the easiest being small and made of the most strong paper. Bald-Faced-Hornets (Dolichovespula maculata, Linnaeus 1763) Bald-Faced-Hornets aren' Hornets like the European Hornet (Vespa crabro)! 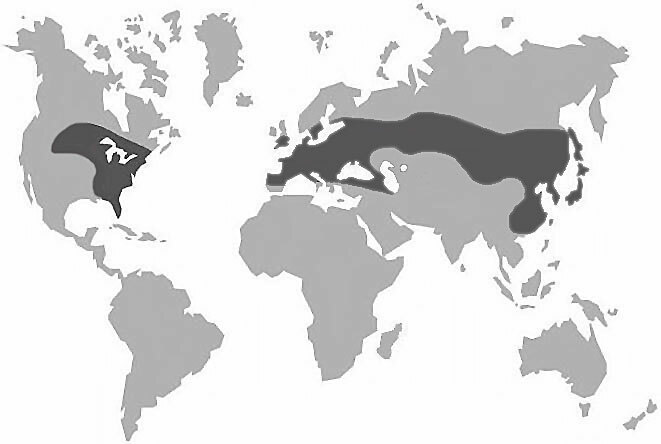 The occurence of the Bald-Faced-Hornet is limited to North America, where it is found transcontinentally. It lives along the west coast, across Canada. On the West coast, it is found from Alaska to southern California. It is also found in the Southwest of the United States and throughout the Eastern U.S. 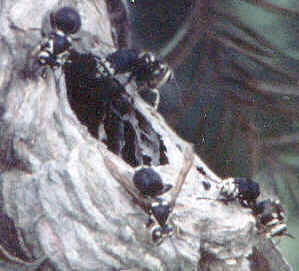 The Bald-Faced-Hornet is a large (>15 mm) black and ivory yellowjacket. Bald-Faced Hornets aren't hornets at all. It can be distinguished from other black and ivory vespines in this region by the lack of white markings of the first three gastral terga. And not really a Yellowjacket, but pretty darn close, this wasp lives in wooded regions. The nests are constructed of a paper-like martial formed from chewed wood. This species constructs almost exclusively gray football-shaped aerial-nests attached to trees and buildings (but they may exceed a basketball in diameter or even the nest may grow to be larger by the end of the summer). The nests are conspicuous and are sometimes near human structures. Many nests are discovered at the end of the summer, after protecting leaves fall from trees. It is often best to do nothing at this time except be aware of avoiding the nest and you could even mark out a caution zone so that others are not surprised. 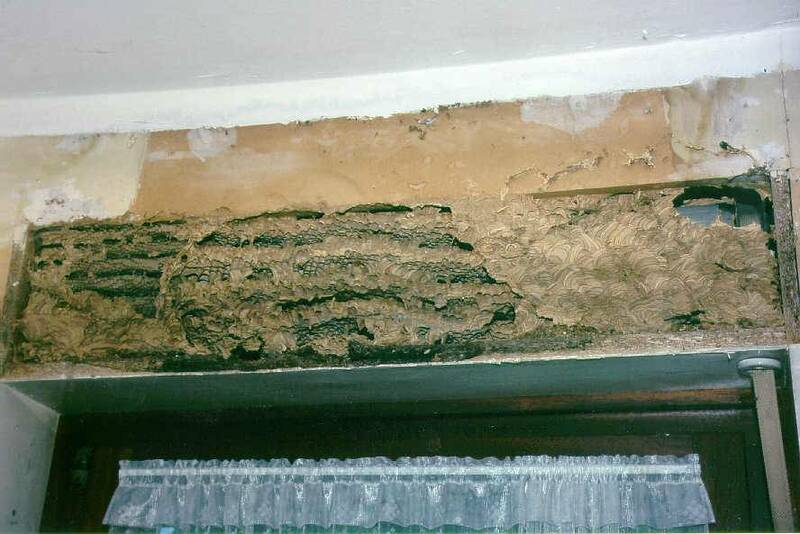 Occasionally, the wasps will build nests under roof overhangs, in attics, crawlspaces and wall voids, or under decks or porches. Foragers are present from June to October. 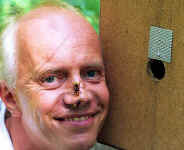 IMPORTANT: Bald-Faced-Hornets, like the European Hornets, are only aggressive when threatened! But the last thing you want to do is to disturb a nest of bald-faced hornets, considering there may be between 400 and 700 workers per colony. If you will disturb them too much, they vigorously defend their nest by stinging any nearby intruder. More information and pictures about the Bald-Faced-Hornets? Follow this Link! The information "Hornets: Gentle Giants!" was arranged by hobby hornet protectors and lays no claim to scientific completeness. We tried to create an outline easily understandable to the layman. It was aimed to clear up the myths and legends associated with hornets and present a brief overview of the most important parts of hornet life. For the interested reader, special biological literature is required to offer a broader spectrum of knowledge! to Mr. Kevin Foster for his participation in the translation of this website!